In 1914, the Fife and Forfar Yeomanry Regiment was a cavalry regiment with its headquarters in Kirkcaldy and squadrons based in Dunfermline, Cupar, Dundee and Forfar. The regiment was sent to Gallipoli in September 1915, and fought there as a dismounted cavalry formation and served until the final disembarkation, being one of thelast units to leave. In just two months the regiment lost three quarters of its strength to casualties and disease. 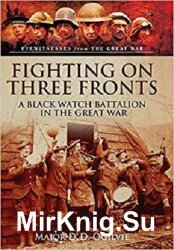 The survivors were sent to Egypt where, in 1917, they formed the cadre of an infantry battalion, the 14th Battalion Royal Highlanders; better known as the famous Black Watch. The 14th Battalion formed part of the 74th (Yeomanry) Division commanded by Major General Eric Girdwood. In Egypt and Palestine, the 14th Battalion fought with distinction against the Turkish forces at the Battle of Sheria in November 1917, and played a vital role in the events leading up to the fall of Jerusalem.